LA / NYC electro duo Collapsing Scenery (Don De Vore and Reggie Debris) have shared new track “Bush Mama Blues” – listen HERE. 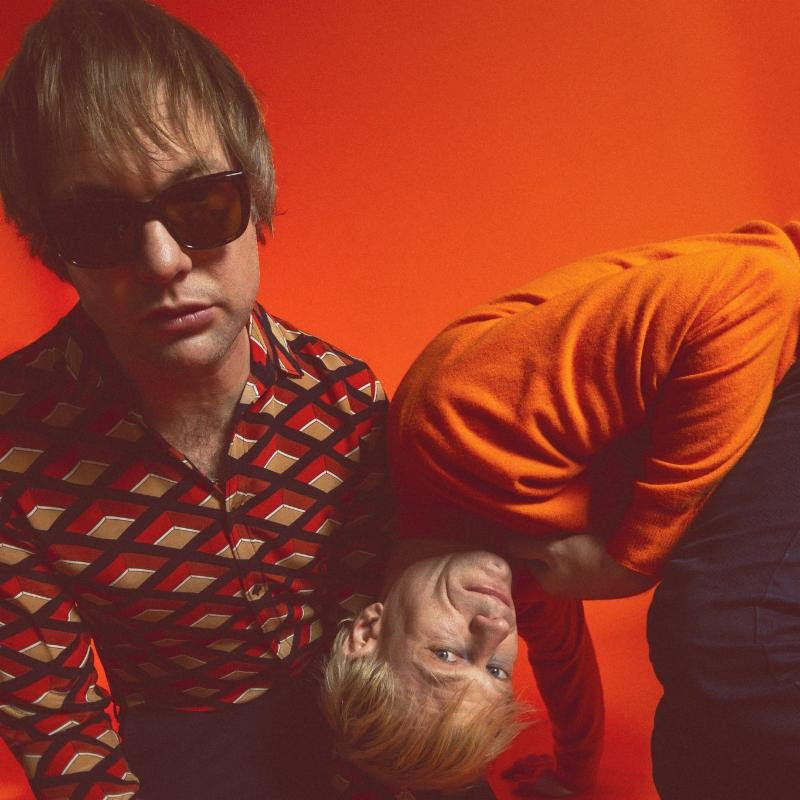 The track is the first single their forthcoming debut album Stress Positions, which will arrive on June 28, 2019 via Metropolitan Indian. The band plays tomorrow night (March 27) to celebrate the release atLA CITA in Los Angeles with NGHTCRWLR (members of King Woman and Miserable), DJ set by Drab Majesty and more. More event info HERE. Collapsing Scenery is the meeting of two fertile and febrile minds, Don De Vore (Ink & Dagger, Lilys, The Icarus Line, Amazing Baby) and Reggie Debris. Together they straddle the gap between music, art, film and politics, seamlessly moving between each with the same ease at which they traverse the globe, soaking up experiences and immersing themselves in different cultures. Since they formed in 2013 “under a pall of paranoia and disgust” they haven’t stopped moving. 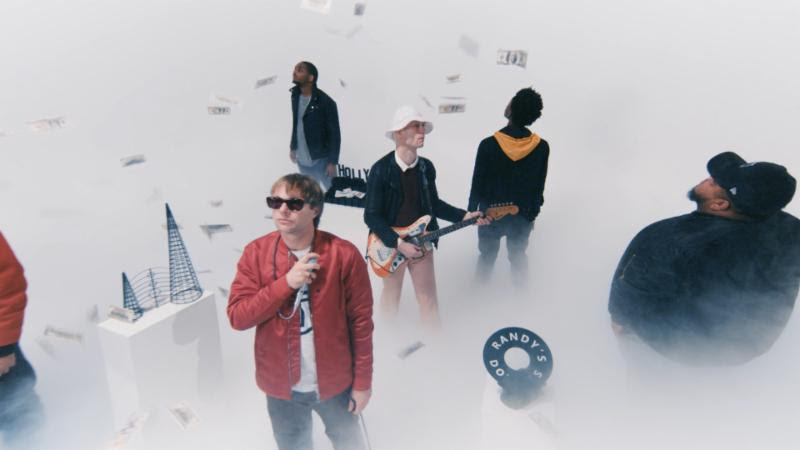 They’ve recently collaborated with Jamaican dancehall legend Ninjaman, Beastie Boys producer/collaborator Money Mark, and no-wave pioneer James Chance. The band also has remixes out or on the way from Genesis P-Orridge (Psychic TV,Throbbing Gristle), Jennifer Herrema (Royal Trux), Uniform, Youth Code, Brian DeGraw (Gang Gang Dance),Oliver, and more. A conversation with them recalls stories of recently recording a ‘goth-dancehall’ track in Jamaica, sailing their soundsystem into Britain for a series of shows, visiting occupied territories in Palestine on fact-finding missions, recording their debut album on a remote ranch in Texas and soaking up rays in Corsica – and that’s in the first five minutes. Their forthcoming debut debut album Stress Positions is a glorious collision of futurist electro, glacial goth tones, techno, post-punk and chillwave recorded using analogue electronics: samplers, step sequencers, synths and drum machines. Aesthetically it initially recalls the early pioneering synth-punk of bands such as Human League, Screamers and The Normal, when the most forwarding thinking punks looked to the twenty-first century. Dig deeper however and it reveals an articulate and highly politicised collection that’s far from mired being in nostalgia for the recent past. Quite the opposite: Stress Positions is a forward-looking album with strong state-of-the-world lyrical content. In the tradition of so many defining electro duos – whether Suicide, Pet Shop Boys or Underworld – Collapsing Scenery’s architecture is entirely of their own creation. They’ve built their own world and live in it. All are welcome. Out of this came Collapsing Scenery, the musical wing of their collaboration. Don De Vore is a mainstay of some of the US’s most exciting and important contemporary bands, having played in Ink & Dagger, The Icarus Line, Amazing Baby, Giant Drag, Sick Feeling, Souls She Said and Lilys. He is also a curator for Brooklyn arts space Trans Pecos. Joining him on vocals is debuting vocalist and lyrical collaborator Reggie Debris, a veritable human riddle wrapped in a mystery inside an enigma. The pair exist to challenge and subvert perceptions in the worlds of outsider art and political protest. And have a great time while doing it. A more recent 2016 artistic residency in New York saw Collapsing Scenery create a psychedelic immersive art installation that incorporated projections, layers of colourful plexi-glass, a reading from Genesis P-Orridge and a performances from De Vore and Debris (meanwhile in a clash of the old and new the gallery upstairs hosted a Picasso exhibition). Collapsing Scenery offer a new vision for how a modern band can be. They’re not even a band – they’re curators of a series of planet-planning events, expressions, exhibitions, albums, installations, journeys, adventures and parties, all operating outside of the confines of the tired traditional industry. “We both like to experience things first hand,” says Debris. “How can you truly comment on, say, the Israel-Palestine conflict unless you go out and talk to people there? We like to go to new places and put boots on the ground to speak. “Travel makes the word smaller and is essential to expanding the creative mind,” adds De Vore. Collapsing Scenery are artistic explorers pushing into bold new futures, then. Join them. LA / NYC electro duo Collapsing Scenery (Don De Vore and Reggie Debris) are excited to announce their hotly-anticipated debut album Stress Positions (out June 28, 2019 via Metropolitan Indian). 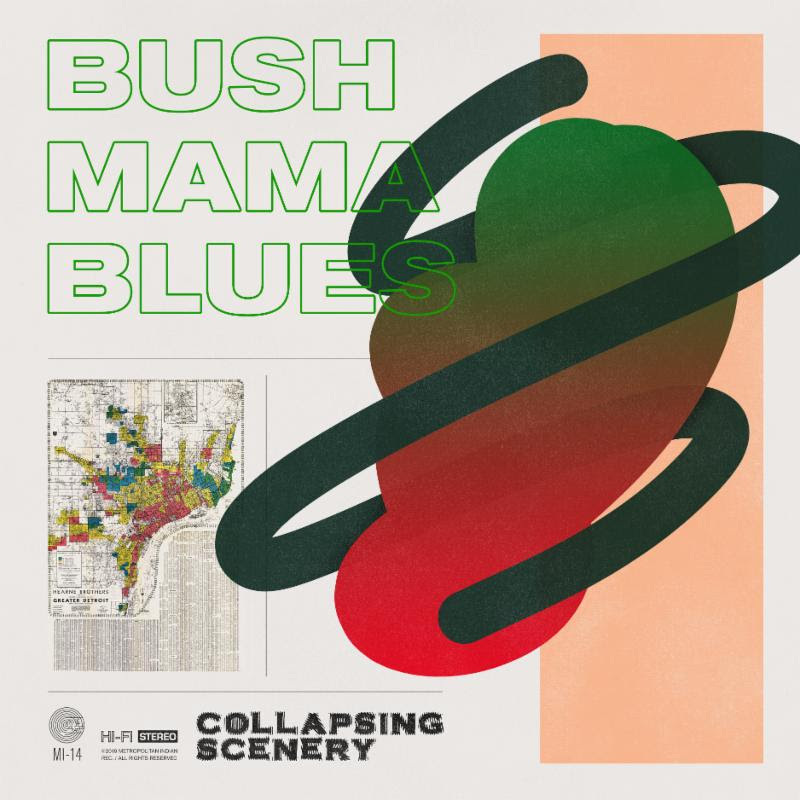 To ring in the announcement, the duo has shared the video for the album’s first single “Bush Mama Blues” — watch HERE. The video, which features impressive moves from Chicago’s esteemed Era Footwork Crew, debuted via Purple Fashion Magazine and is now available to stream or embed HERE. Collapsing Scenery will be celebrating the announcement with a free performance at Home Sweet Home in New York City tomorrow night with Chung and more special guests — more event details HERE. “Don and I started this project during a time (2013/14) when it seemed that the Left had completely capitulated and resigned itself to the world order that first stirred under Carter, blossomed under Reagan and Thatcher, and reached a depraved apotheosis under Clinton and Blair. 9/11 then radically scrambled politics and rendered an entire decade of discourse frantic and dumb. We were left under Obama with a zombie Neoliberalism that dragged its desiccated corpse in a well trodden circular path laid out by 40 years of degraded politics and failed theory. Since they formed in 2013 “under a pall of paranoia and disgust” they haven’t stopped moving. They’ve recently collaborated with Jamaican dancehall legend Ninjaman, Beastie Boys producer/collaborator Money Mark, and no-wave pioneer James Chance. The band also has remixes out or on the way from Genesis P-Orridge (Psychic TV, Throbbing Gristle), Jennifer Herrema (Royal Trux), Uniform, Youth Code, Brian DeGraw (Gang Gang Dance), Oliver, and more. The pair exist to challenge and subvert perceptions in the worlds of outsider art and political protest. And have a great time while doing it. A more recent 2016 artistic residency in New York saw Collapsing Scenery create a psychedelic immersive art installation that incorporated projections, layers of colourful plexi-glass, a reading fromGenesis P-Orridge and performances from De Vore and Debris (meanwhile in a clash of the old and new the gallery upstairs hosted a Picasso exhibition). Collapsing Scenery offer a new vision for how a modern band can be. They’re not even a band – they’re curators of a series of planet-planning events, expressions, exhibitions, albums, installations, journeys, adventures and parties, all operating outside of the confines of the tired traditional industry.